Study your Advanced Level mathematics course online. Over 7900 pages of content ranging from illustrations and explanations to fully-worked exam questions and automatic assessment - also includes all of GCSE/iGCSE. Almost every page is interactive, offering you much more than simply an online textbook. AQA, OCR, OCR-MEI, EdExcel, CCEA, WJEC, Scottish Highers and Advanced Highers, AP Calculus and International Baccalaureate Diploma courses HL, SL and Mathematical Studies, Indian CBSE - and new universal, pre-university and university methods courses. Including advice from examiners and tips on improving exam technique, advice on graphic calculators, a vast Graph Library, Discussion Group to share mathematical problems, Interactive Glossary and more. A complete assessment package has been added in to the site, enabling students to record and track their progress using a variety of tests and challenges. Teachers are provided with records of this student progress and can use it for diagnosis, feedback and help. Everything is marked and assessed automatically on-line and results are fully downloadable to your spreadsheet. 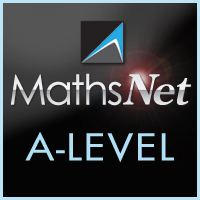 For further details see MathsNet A-Level or to order see below. New for 2018: Updated content for the post-2017 syllabi. Updated questions. Works on most devices. Access all the exam boards at no extra cost, including GCSE! 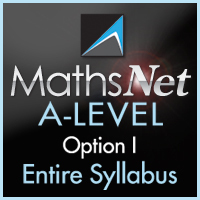 Complete access to all our coverage of the exam board of your choice - AQA, CCEA, CIE, Edexcel, OCR, OCR-MEI, Scottish Highers and Advanced Highers, WJEC, AP (Advanced Placement) Calculus or IB (International Baccalaureate - all 3 IB levels HL, SL and MSSL together) or a generic "Universal" advanced maths course, or a course for pre-university, or a typical university mathematical methods course. From this link you can see the subscription options for accessing the entire syllabus of your choice, and make your choice of subscription option and syllabus. 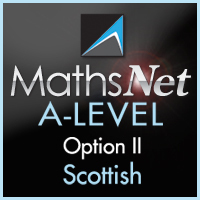 From this link you can choose licence options and prices to access the entire syllabus for Scottish Highers. 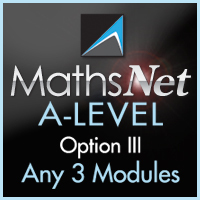 Equivalent to AS or A2, ie any 3 modules (free choice of which 3). If you select more than 3 only the first three you select will be activated. From the links below you may select your syllabus and then go on to select how many licences you want and to pick any 3 modules.